In my case, I see a dozen messages like this one every day. 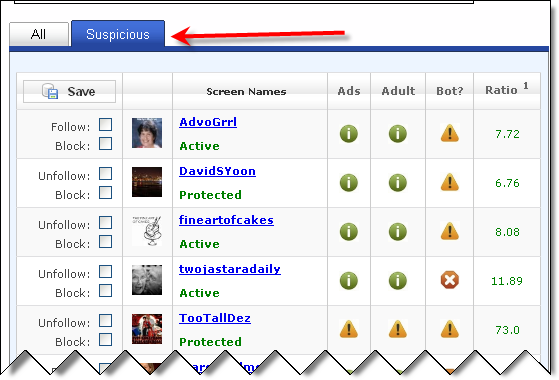 The idea behind TrueTwit is to eliminate or cut down on spammers or adult-oriented users from following you on Twitter. It does so by requiring you to click on the link in the DM and then fill out the words shown in images on a ‘Captcha’ form. (see image below). Once you’ve filled out the form, the system follows you back on the users behalf. The system prevents automated follower systems from adding you. However, it doesn’t mean you won’t see any spam because it doesn’t prevent a spammer that’s not an auto-bot from filling out the form. If you’re not interested in following a lot of people on Twitter, this system will probably work for you. If you follow a lot of users, though, it can really be a chore to go through this process several times a day. TrueTwit offers two ways around that. It’s free and once you sign up, you’ll no longer have to fill out the Captcha form. There is a catch, however. Now any new people that follow you are sent the same direct message and have to fill out the form. Once they do, you’re sent an email and can then choose to follow them back or not. Or you can set the system up to auto-follow anyone that goes through the validation process. You can customize the message that’s sent out. The premium plan gives you the option of turning off the auto-DM’s entirely. If you choose, the system will auto-follow anyone that meets their follower analysis. That means they have to be ‘all-green’ by the system’s definition. (See Follower Analysis below for details). In fact, the biggest problem I found once I signed up was the complete lack of a help/FAQ section or any type of instructions at all. There are some additional features included with the Premium account but their of limited use without instructions. 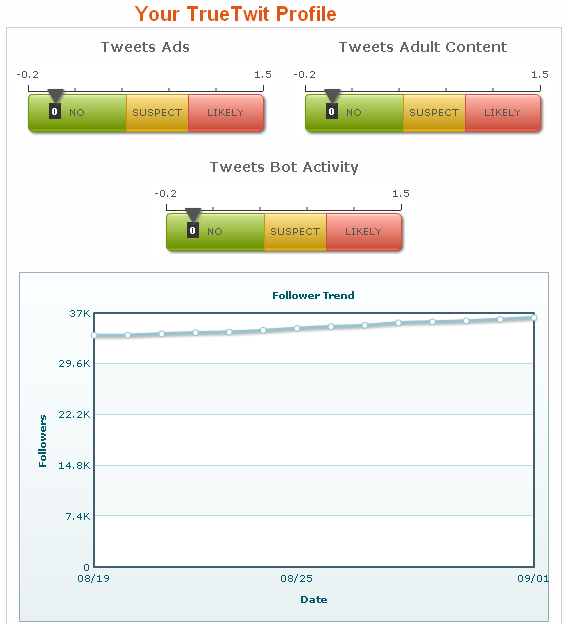 The Dashboard shows me how I measure up in their follower analysis. According to my dashboard, I’m not posting a lot of ads, adult content and I’m not an auto-bot. The challenge here is that what they consider to be an auto-bot isn’t defined. Does it mean anyone that’s using a 3rd party system like Tweetdeck or SocialOomph? And what do the numbers on the graphs mean (-0.2 to 1.5)? No explanation is offered. 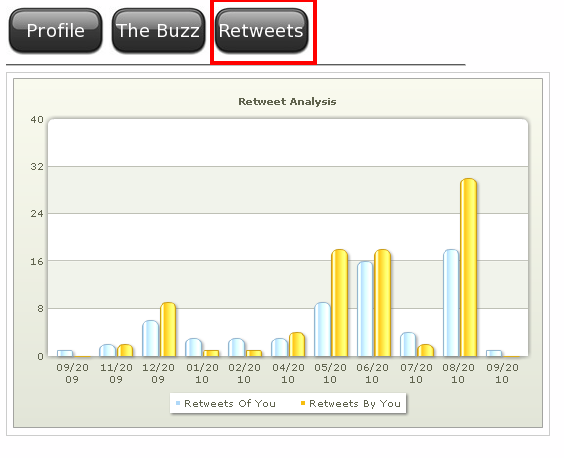 This feature allows you to display a list of Tweets that mention a certain name or company. I looks like it’s just a duplication of the search feature already built into Twitter. This may have been something created before Twitter built the search function into their user interface. This is an analysis of how many times you retweeted others and how many times others retweeted you. I was confused by the numbers at the bottom of each column at first until I realized that it’s a date from a particular month. So the first column is from 09/20/09 and the last column is, I assume 9/20/10 although as I write this, it is 9/1/10. So what’s the significance of the 20th? And why isn’t this more clearly defined? I guess the programmers feel that all their users will understand what a bot is and how ‘bot characteristics’ are measured because it isn’t defined. The final column “Ratio” is actually a followers to following ratio and it is defined further down the page. I believe this is the only criteria in the entire system that is defined in any way. I checked out some of the users that were rated as High in the ads and adult categories and found the description to be fairly accurate. However, in the Bot category the results were inaccurate for the 2-3 users I checked. One user, that appeared to be a teenager, had a single Tweet about going swimming with a friend (see image below). There was a real photo, a background image and a bio and zero indication this was a spammer or a bot. According to the site, if you choose the auto-follow option rather than sending out DM’s, they will only follow back users with ‘green’ rating in all three categories. So that means you’d lose any potential followers that were borderline or, like the example above, were generating a false-positive. TrueTwit allows you to pay via Amazon Payments, Paypal or Google Checkout. The process is set to auto-renew every year unless you cancel. A year is a long time so I set a reminder in Outlook to remind me a week or so in advance that the renewal date is coming up so I can cancel if I choose. There was also a glitch in the system in that the first time I registered and chose the Premium option, the system created a Basic account and didn’t ask for my payment info. Once the account was created and I confirmed my email address, I saw the option to upgrade to premium and did so. This time, it went off without a hitch. My guess here is that this is just a matter of not wording the instructions properly rather than a glitch in the system as many systems like this require you to register for the free account first. None of the additional features are must-haves or even particularly useful. In terms of screening out spammers, your options are to either send out an auto-DM to every follower (something I thing places an unfair burden on the new follower) or, with the premium package, to let TrueTwit follow people for you after screening them. With evidence that the system mislabels many users as bots, I wouldn’t risk it. However, you might feel that it’s worth losing a few legitimate followers to get rid of the spammers. If so, this system will likely work well for you. The value I see here is for power users or anyone else that doesn’t want the inconvenience of having to fill out those captcha forms when you follow someone using their system. I would much rather pay $20 a year than spend five to ten minutes a day going through their validation process. So I’d sign up and just uncheck all the options on the “Edit Account” page and I’ll continue to manage auto-followbacks through another service (SocialOomph). Personally, spam in my Twitter stream doesn’t bother me as much as spam in my in-box because I use HootSuite (review coming soon) to filter out who shows up in my Tweetstream anyway. For social media managers like me or anyone that’s managing more than one Twitter account, I’d like to see a multiple-user version. As it is now, you’ll have to pony up $20 for each account. According to the website, that’s a feature the company is considering but it’s not available at this writing. To sign up or find out more, go to http://truetwit.com/ (I’m not affiliated with TrueTwit and do not receive compensation if you sign up). By the way, if you’re a TrueTwit user, I’d love to hear your take on the service. Leave us a comment below and let’s talk about it. I also emailed customer support to get their feedback on my review but haven’t gotten a response yet. I’ll post an update if and when I hear from them. A very good review, the best I have seen. It is certainly not worth it for me! Thanks, Clive! I’m glad I was able to help you make a decision! Thanks, Ben! I posted a comment over on your blog, too. After using it now for just over a year, I find it’s worth the $20 which eliminates the hassle for me of dealing with their approval tweets without inflicting the same on those that choose to follow me. Although it could be a coincidence, it seems like when I start managing accounts for others, once I approve a few TrueTwit clients messages, the messages start to increase. Call me paranoid but it almost seems like that if they see that you’re willing to fill out the form, they turn up the volume so you’re suddenly doing it several times a day and begin to consider signing up. Thanks for this article. I hate seeing those TrueTwit requests, but the options for getting rid of them stink! I would pay $20 a year to not need to fill out those CAPTCHAs all the time, but your review shows me that the “premium” account creates as many problems as it solves. Thanks!! I’ll spread the word: TrueTwit=TrueHassle! I couldn’t agree more. Thanks for your comment! I don;t care who follows me. They can be human, spammer, bot, pr0n… why should I care _who follows me_. Their tweets aren’t in my stream because _they follow me_ (I don’t follow them). They can’t send me a direct message because _they follow me_ (I don’t follow them). They could @ me… but ANYone can @ me; no one needs to follow to do that. I can only see this as useful for people who automatically follow back, and auto-followback is the wrong approach. This doesn’t solve any problems that I can think of. I just got my first “TrueTwit” validation DM yesterday. I did a little online research and have unfollowed that person. The wrong approach? I don’t know if I’d agree. Some people think it’s a courtesy to follow someone back that follows you. Others disagree. I don’t think either approach is right or wrong. It depends on their particular strategy. I choose to follow-back automatically. I’ve get too many followers to review them manually. If I see someone in my stream that I don’t want in there, I’ll remove them. I was getting dozens of those messages daily. It was worth paying $10 to get rid of them. I am pretty much fed up with TrueTwit. I pay the premium and yet they constantly send out the DMs even though I have opted out of that feature. I’ve had to reset it twice already today. Twitter has gone after some truly valuable services, such as ManageFlitter, while ignoring the annoyance that is TrueTwit. You’re damned if you do and damned if you don’t. Sign up with them and pay and still have DMs going out, having to constantly reattach the app, or don’t sign up and have to deal with the annoying captcha. I’ve signed up with TrueTwit and canceled twice already. And guess what? I’m cancelling again today. I believe they cost my in followers. I’ll just have to get cozy with captcha. Really I feel as if TrueTwit is a legalized hostage taker. You forgot to mention or you were unaware that when TrueTwit DM’s a potential follower and said follower complies and validates, Truetwit then leaves cookies in your computer. They have no reason to do that because your asked to validate each time a different truetwit user sends out a DM. The first time that you are validated should be the last time and any subsequent requests should have the next truetwit user get a message advising them that this account has already been validated, you would think that should happen since they leave cookies. So let me say I am alleging that truetwit is spamming you, I deleted all the truetwit cookies in my computer, then I posted in my bio No To TrueTwit. I allege it to be a scam, and I am filing a formal complaint against them with Twitter. I also think when you reach out to follow an account and instead of receiving a thank you, the first thing they send back to you is I think your a spammer validate yourself. I say to myself how insulting so #$%^ you and I automatically unfollow. I am also trying to develop an app that will automatically unfollow any account that sends you that stupid insult.